Blackie awoke in the night with a leg cramp. She stretched with care not to disturb her sisters’ sleep. “Urrrr,” she sighed with relief. “Another craaamp?” whispered Silver who roosted beside Blackie. Blackie and Silver looked outside the window into the cold, glittering darkness. “See the bright, rising star?” Silver asked. Blackie’s eyes popped wide open. “It has a tail!” she gasped quietly. “Mother never mentioned a star with a tail?” Silver asked. Silver rolled her eyes and hushed Blondie who had the habit of dipping into private conversations. “You mean your tail is like Mother’s,” Silver refuted. The five hens stretched their legs and wings, turned this way and that upon the pole, and at last roosted close and cozy. “Now, what was the disturbance about?” asked Brownie. Before Blackie or Silver could reply, the star’s dancing beam aligned level with their eyes. “The cause of the disturbance,” Silver said. “Did Mother mention a star with a tail feather to your girls?” Blackie asked Goldie and Brownie. A melancholy mood fell within the henhouse. “I remember Mother gathering us under her wings,” Blackie said. “And ‘We’re stronger together than apart,’” Brownie added. The sisters roosted in peace and watched the star’s tail rise out of sight before they fell asleep. 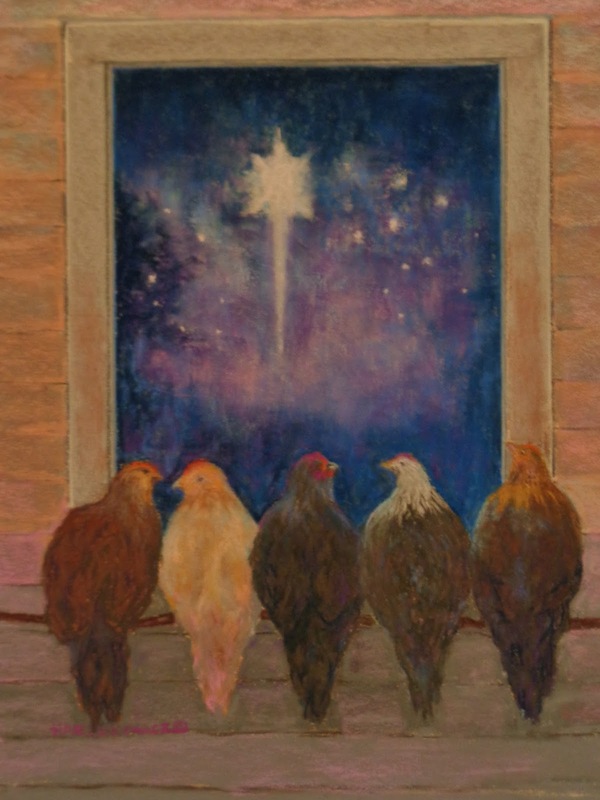 By dawn the hens had forgotten the star. They drank their water and ate their grain. They nested and laid eggs while waiting for Lem or Lee to bring their late morning oatmeal. As Lee turned the straw, scrapped their roost posts, and gathered eggs, she sang a song. Do you see what I see? A star, a star, Dancing in the night. “Yes!” the hens screeched, remembering the star. “Thanks for the eggs,” Lee said and closed the henhouse door. The sisters cocked their heads and blinked to one another. “I know,” said Silver with a twinkle in her eye. “Buook! What, Silver?” Brownie asked. Blondie, Brownie, and Goldie turned to their eldest sister. We're stronger together than apart.